One week left in our Winter Warriors Competition! If you aren’t already racking up your trips, you still have time! 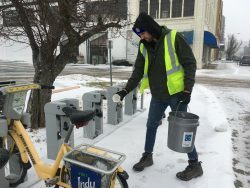 The Indianapolis Cultural Trail and the Pacers Bikeshare are encouraging you to get out there and ride this winter. We’re tracking trips from December 1 – January 31 and giving out prizes to the rider with the most trips and miles ridden. Worried about the weather? No need! Our Pacers Bikeshare Team works hard to make sure bikeshare stations are cleared of snow and are easily accessible. So you have nothing to worry about but having a refreshing ride this winter! If you aren’t a Pacers Bikeshare member but still want to bike this winter, we’re offering $5 Day Passes, $3 off our usual $8 passes. We’d love to see you out and about on the Pacers gold bikes so take a picture and tag @PacersBikeshare to be entered to win a Month Pass! Get out there and show us what you’re made of. There might be snow and ice and the chill on your face might sting but the Cultural Trail will remain accessible (snow and ice free! ), all winter long.